However, none of those excuses are good enough for me. Automation has saved me more time and money than I could ever assign a real number to. It changed my life, and the life of my business. I owned a digital marketing agency that started up in my upstairs bedroom and grew into a multi-million dollar organization. I didn’t get there on my own – I had a mentor, and I had automation that got me to that level of success. 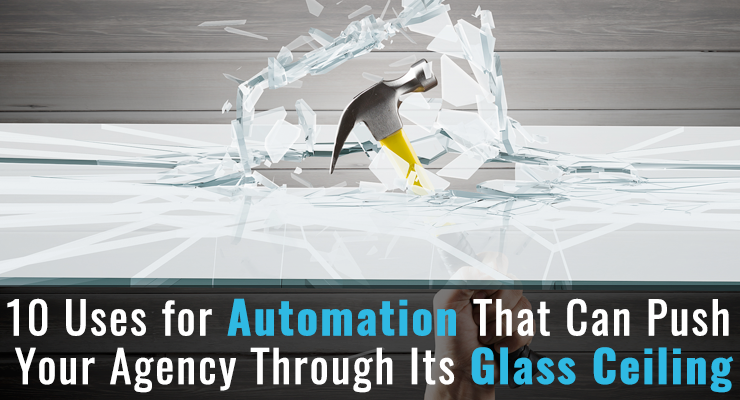 That being said, here are our 10 Uses for Automation That Can Push Your Agency Through Its Glass Ceiling. Yep, you heard that correctly. Automate your coffee run. You’d be surprised if you knew how much time per week/month that coffee runs take. Let’s say you have 10 employees. On average, maybe 2 of them are 5 minutes late every day because they were picking up coffee on their way in. Let’s say 2 others get to work on time, but spend 15-20 minutes per morning making coffee in the kitchen and getting distracted instead of getting to work right as you open. You might look at that as minute and trivial. But in the bigger picture, when you consider that 30 wasted minutes every day means 2.5 hours of work per week, and almost 10 hours of work per month (the equivalent of losing more than a full work day per month) that could have been spent doing something that actually pertained to business…. you might see the value in an automated coffee run. We know you care, but your clients should know you care, too! This particular aspect of automation puts a little extra smile on your clients’ faces. We all like opening our email inbox on our birthday and seeing how many emails we got that say “Happy Birthday!” This is what I like to call…. The Extra Mile. Don’t let them forget about you. Set up a mini-introduction campaign after every event you go to that reminds the prospects at that event that you’re still there and you want to meet with them. Send out a few of those emails, throw them into your generic New Lead Nurturing campaign, and send them into the Sales Pipeline where your staff takes the time to give phone calls and send out automated emails to keep up with your potential clients. Don’t lose another lead due to follow-up failure. It’s priceless to know how to pinpoint exactly where each of your prospects are in the decision-making process. The Sales Pipeline Automation process allows you to send your prospects down the pipeline where they are clearly marked as “Interested in Product A,” “Left Voicemail #1,” “Scheduled a Meeting – Product B,” and so on. That way, you’ll better know how to market to them, and so will every other member of your team who speaks with that prospect. Stop wasting time digging up W-9s! Automate the distribution and collection of W-9 forms. You are able to deliver a link to the form that follows up with the other party if they don’t send it back to you within a day. You can trigger it automatically or manually, whichever is easiest for you. Campaigns like these are easy to set up, and save you tons of valuable time. Think about the amount of time that you or your staff spend per week on the phone scheduling and rescheduling with clients. Isn’t it awful? We know there are plenty of prospects and clients who prefer an actual phone call, and we aren’t saying to lose regard for those people. We are saying that there is a good percent who will prefer scheduling time with you on their own, and being able to save just THAT much time alone will be worth having your online scheduling link in your emails, on your website, your social media accounts, and just about anywhere else. If they’re not ready to buy right now, they might be later. Don’t lose out on opportunities just because they sit in the oven a little bit longer than others! Our business as well as many businesses that we’ve coached have experienced a few slow-cook clients. Maybe they didn’t have the time or money when they came into your system initially, but after a few months or even years, after your name has been in front of them consistently, you were the first person they thought of when they needed services that you offer. You want to communicate with your new leads a little differently than your long-term clients. You’ll want to be a little more “hard-and-fast” with them, if you will. One email every few weeks won’t get the brand penetration you want, so having a separate new lead nurture campaign is totally necessary to getting the followup your leads need. Plus, with this campaign, you’ll be able to do all of the behind-the-scenes business automation as well. Send out staff reminders to email or give a phone call to your hot leads and get them in a meeting. Filling out forms every few minutes to register people for your event can be time-consuming and aggravating. Also, if your prospects are the ones filling out the forms, they shouldn’t be. Eliminate barriers to entry, and stop wasting time. We’ve found a way to do one-click registration for webinars and other events in all of our emails to our already-existing leads, and that has proven to convert very well. As far as colder leads are concerned, a first name and an email should suffice! Have you ever wanted to coach the entire planet, but never had the time or the resources? Well now you can. We’ve just gotten our online courses going strong and we plan to use them to get to each and every business owner out there, because shared knowledge is the key to success for both our company and our clients’ companies.